Presidential Advisory Committee Against Corruption (PACAC) Chairman Prof Itse Sagay (SAN) yesterday explained why Chief Justice of Nigeria (CJN) Walter Onnoghenâ€™s assets non-declaration charge cannot first be determined by the National Judicial Council (NJC). In a statement, the eminent Law professor, citing constitutional provisions, argued that not every offence committed by a judicial officer must first be brought before the NJC. He said: â€œBy the very logic of the powers of the NJC, cases arising out of a breach of the Code of Conduct Bureau and Tribunal Act and the Code of Conduct provision in the Constitution cannot come before the NJC. â€œIf the NJC first decides the matter before the defendant is arraigned in court or at the Tribunal, what happens if the NJC finds the defendant liable and removes him from office as a Judge? In that case, he ceases to be a Judicial Officer as well as a Public Officer. â€œCan he, therefore, be tried as a public officer before the Code of Conduct Tribunal? The answer is no, because he is no longer a public officer. Faulting the arguments that the prosecution ought to comply with the Court of Appeal decision in the case of Nganjiwa vs. F.R.N., the PACAC chair said: â€œIt should be noted first that this judgment contradicts the clear provisions of the Code of Conduct as established in the Constitution which gives the Code of Conduct Tribunal jurisdiction over all public officers, including the Chief Justice of Nigeria. (See 5th Schedule, Part One, of the 1999 Constitution). â€œMoreover, the Court of Appeal in Nganjiwaâ€™s case was directing its judgment to a judicial officer committing an offence in the process of carrying out his duties as a judge in a court namely: demanding bribe from a party to the case before him. â€œTherefore, the ratio decidendi in this case is much narrower in scope than is being touted by our all mighty Senior Advocates of Nigeria (SANs). Filling an Assets Declaration Form is totally outside the ambit of a judicial officerâ€™s work. It applies to all public officers. â€œIf one may ask â€“ should a drunken judge behind a car steering wheel kill an innocent pedestrian, will the offence be taken before the NJC, before the police can act on the crime? â€œIndeed, in spite of its defects, the Court of Appeal judgment in the Nganjiwaâ€™s case expressly limited reference to the NJC only to cases of a judicial officersâ€™ misconduct in court whilst exercising his authority as judge in case before him in court. Besides, Sagay believes that the NJC cannot be expected to be fair in Justice Onnoghenâ€™s case. â€œAlmost all the Senior Advocates of Nigeria have argued that even in a case involving the breach of the Code of Conduct, for which the law has already made express provisions, the matter shall be taken to the NJC rather than to the Code of Conduct Tribunal. â€œThey canâ€™t be serious. They must obviously be speaking tongue in cheek. Even a baby, three months old, must realise that no one can get justice against the CJN at the NJC. The CJN is not only the Chairman of the NJC, he is also the appointor of 20 out of the NJCâ€™s 23 members. The CJN is the NJC. â€œOnly a grossly ignorant man or an extremely mischievous one could seriously suggest that a matter involving the CJN should be brought before the NJC for adjudication. â€œTherefore, the whole idea of taking the present case to the NJC is a nonstarter, for that would make the CJN the Chief Judge of his own case â€“ a clear violation, not only of the Constitution, but also of a long standing common law principle coming all the way from MAGNA CARTER in the year 1215,â€ the PACAC chairman said. â€œWhy is Nigeria such a Theatre of the Absurd? Today, we are only talking about preliminary objections, interim injunctions, challenge of jurisdiction, wrong procedure, etc., etc. Nobody is talking about the substantive issue any longer. That is now lost in the sands of time. â€œDid he do it? Did he not do it? The questions we should all be asking are contained in the front page of The Nation Newspaper of Tuesday 15th January, 2019: Did the CJN fail to submit a written declaration of all his assets and liabilities within prescribed period of three months after being sworn it? â€œDid he omit to declare a domiciliary (US dollar) account No. 870001062650 maintained with Standard Chartered Bank Nigeria Limited? Did he falsely omit to declare a domiciliary (Euro) account No. 93001062686 maintained with the bank? â€œDid he falsely omit to declare a domiciliary (Pound Sterling) account No. 285001062679 with the Bank? 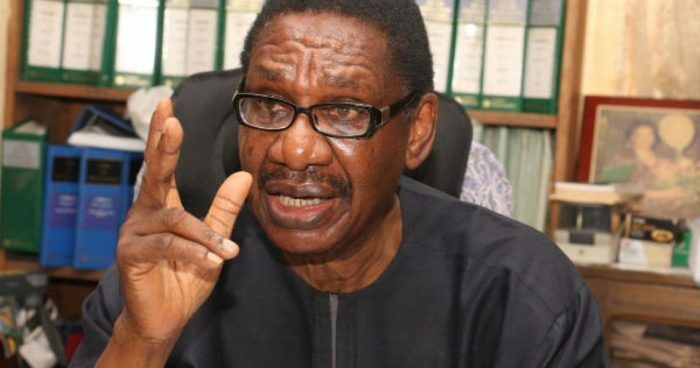 Sagay advised Nigerians not to be distracted by what he called a vicious and fraudulent campaign intended to sacrifice the substance and justice of the case on the altar of technicalities, adding that the truth must not be the first casualty in the matter.